The school board voted to amend the school calendar to provide make-up days on March 29 and April 19. March 29 will be a make-up day for ALL students in grades K-12. It was set aside as a grading day. April 19 will be a make-up day for students in grades 6-12 ONLY. The date was scheduled as a professional development day. As of February 20, 2019, we are the equivalent of two days short (in hours) for our secondary students and one day short for our elementary students. Read more. A dozen students from the St. Croix Valley Area Learning Center (ALC) received their diplomas Friday. 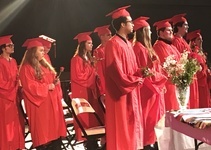 The ALC held a mid-year graduation ceremony at the high school auditorium. Family, friends, classmates and staff proudly looked on. This year’s class motto is “Still We Rise”. The school board approved a second round of budget adjustments on Feb. 21, which balanced the general fund budget for the coming year and began to rebuild the fund balance. Adjustments were made by increasing some student fees, reducing the district’s technology budget and reducing custodial staff through attrition. The board also approved further reductions to administrative staff and professional development. When combined with adjustments approved in December 2018, the total adjustments for the coming year equal $2.095 million. Read more. A group of more than 30 Stillwater area students, teachers, parents and several school board members spent a day at the Capitol talking with legislators about education-related issues. The group shared the school board's legislative platform, and spoke specifically about the need to better support our schools in the areas of special education, mental health and school safety. The group also advocated for stable state funding that keeps up with annual inflationary costs. The district is convening a a Long Range Facilities Planning Task Force and we need your help! We’re now accepting applications for task force members who will work to make recommendations to the school board on ways to enhance our facilities to better support our students and the needs of our community. Read more. The deadline to apply is Sunday, March 10, 2019. Apply online. 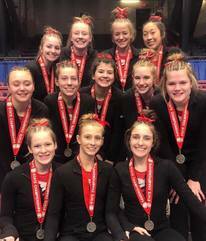 Congratulations to the gymnastics team for placing second at state! Stillwater finished with a score of 148.625. The Ponies also received the Class 2A Academic Award for the highest team GPA of 3.975. Two hundred fifth graders from across the district performed in the Winter Festival Orchestra Concert. 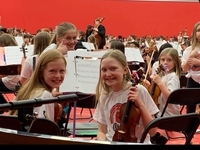 They did an excellent job playing several pieces and were joined in a finale with seventh grade orchestra students from Oak-Land and Stillwater middle schools and the Con Amici Chamber Orchestra from Stillwater Area High School. 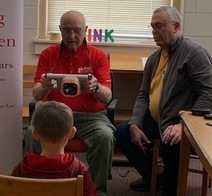 About 250 preschoolers were provided free vision screening thanks to a partnership with the Lions clubs of Afton/Bayport/Lakeland, Lake Elmo, North St. Paul, Scandia/Marine, and Stillwater. The Lions purchased a high-tech digital camera that quickly takes a picture of a child’s eyes and can immediately identify eye disorders with 90 percent accuracy. The screening was part of a nationwide initiative called Lions KidSight USA that targets children from 6 months to 6 years of age. You're invited to "Party like it's 1989"
Mark your calendars for the Partnership Party, Friday, April 5 at JX Event Venue in Stillwater. The Partnership Plan's annual fundraiser raises funds for small classroom grants to teachers as well as district-wide educational initiatives that help enhance opportunities for our students. 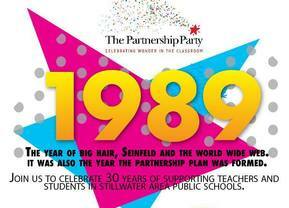 This year marks the Partnership Plan's 30th anniversary so they will be celebrating with an 80's themed party. Buy your tickets online.